While enjoying time with family and friends on Christmas morning, don't forget to eat! We've assembled a great collection of some of our favorite breakfast for a crowds, including casseroles, cinnamon rolls, muffins, quiche, and more. 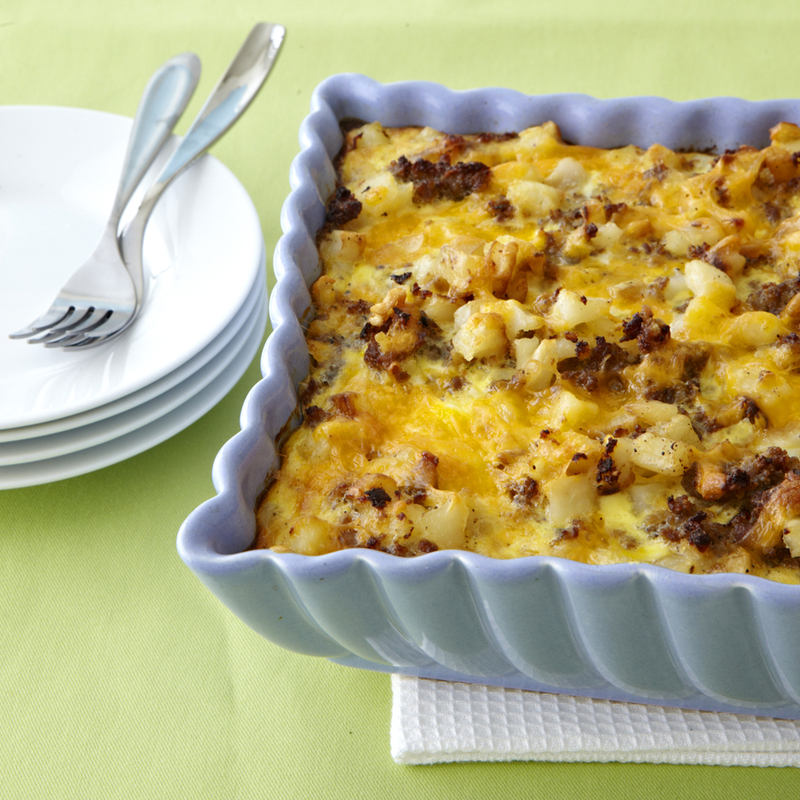 This stand alone breakfast dish is an upgrade from the usual breakfast casserole. Baking eggs in brioche and heavy cream allows for perfectly set, soft, and runny eggs. Fresh herbs and rich egg and meaty sausage flavors round out this bake and give it irresistable texture. Ask for brioche at your local grocery store or bakery and they are sure to have it. Make holiday mornings even more special with this raspberry danish. Tender, golden dough filled with fruity jam enriched with cream cheese creates the perfect pastry to serve family and friends. Master the jelly roll technique by following the steps in this simple recipe. Save time in the kitchen on Christmas morning by prepping this dish ahead of time. Bring it to room temperature before baking so it will reheat evenly. If you're looking for decadence, you're in the right place. Though the dough requires multiple steps, the result is a bun that is sweeter, stickier, and more gooey than any bun you've had before. Our chefs joke about wanting to take a nap after experiencing the richness of this dessert. Saigon cinnamon is recommended for a stronger spicy-sweet flavor, but regular cinnamon can be easily substituted. Serve with coffee at brunch or as an afternoon treat. The smell of freshly baked cinnamon rolls is enough to get any sleepyhead out of bed. On Christmas morning, serve these cinnamon rolls with a tall glass of milk or a cup of piping hot coffee. All you need is some great coffee to accompany these delicious beignets! You can make the praline filling and dough up to two days ahead. Photo by Ken Carlson, Waterbury Publications, Inc.
A veggie-loaded frittata is a great way to use up produce odds and ends. Broccoli is an excellent addition here: The florets poke through the egg mixture and become delightfully frizzled in the oven. Look for refrigerated pico de gallo in the prepared produce section of the supermarket. You can also fold the pico into the egg mixture before cooking; simply drain off the excess liquid first. Serve with a simple salad made with the remaining arugula you bought. You can assemble this up to four days ahead, and keep in the fridge; then let it stand at room temp for 30 minutes before baking. This casserole is rich, delicious, and worthy of Christmas breakfast. Gruyère cheese browns beautifully and adds a nutty flavor to the dish. You can sub Swiss cheese if you prefer. Pam found this recipe in an old issue of Southern Living and was making this family favorite long before joining the staff in 2003. Refrigerate any leftover ham in individual servings. In the days after Christmas when your house is still full and your energy is waning, this will make it easy for guests to fix a meal on their own. Mint-Lime Simple Syrup may be kept in refrigerator up to 2 weeks. Use leftovers in cocktails and to sweeten iced tea. Or spoon it over any fresh fruit. Prep this the night before for an easy breakfast or brunch. Find turkey sausage in the freezer section of the supermarket with other breakfast meats. This Mexican-style skillet dinner makes a good brunch too. If you can find large yellow canned limas--a variety known as butter beans--choose those over the smaller green limas; they have a deeper, richer flavor. "Wash these warm, sugary doughnut bites down with a shooter of ice-cold chocolate milk. I like to stick the milk in the freezer about 10 minutes before serving." Earthy buckwheat is blended with ginger, spices, molasses, and toasty-tasting brown rice flour to make an unexpectedly light muffin that's great with sour cream or butter. Be scrupulous in your timing with the food processor; "overprocessing buckwheat flour can make the muffins mushy," Medrich says. For more on the ingredients, see "Power Flours," below. Some people toast special occasions with Champagne, but here at Southern Living, we often celebrate with "Pam-cakes." Developed by our Test Kitchen's Pam Lolley, these flapjacks are deceptively light, unbelievably fluffy, and impossible to resist. End your morning with this decadent Chocolate Latte. Don't forget the whipped cream! Customize your topping with any fruit-nut combo. We like plum preserves, sliced plums, and almonds, or strawberry jam, sliced strawberries, and pecans. If you'd prefer a beverage with less spice, try substituting apple juice for the apple cider. It's fantastic either way. This decadent French toast with caramel gets lightened but without losing the rich flavor everyone loves. Keep it simple with a great breakfast of scrambled eggs, sausage, and veggies. While traditional Belgian waffles are made with yeast, we use beaten egg whites to give these salty-sweet waffles their light, airy texture and crispy exterior. For freezing and heating instructions, see below. Everyone loves waking up to the smell of coffee and the smell of bacon, and the flavors are pretty awesome together too. Add some molasses-y brown sugar, and you'll reach bacon nirvana.